Have you ever wondered what it would be like if you can visit some of the places in the films of acclaimed Japanese animator and director Hayao Miyazaki? We know, it’s going to be surreal because some of the places in Miyazaki’s films seem very picturesque to actually exist in real life. But there is in fact a place that resembles some of the settings in Miyazaki’s most top-billed film: Spirited Away (2001). This place isn’t located in Japan though; it’s rather hidden in the mountain area of Rufang District in Taiwan called Jiufen. Because of its striking similarity to Miyazaki’s Spirited Away, the mountain village became a popular tourist attraction in Taiwan. And although several guidebooks and articles claim that the place inspired Miyazaki for his film, Miyazaki cleared that it wasn’t. According to Miyazaki, he based several of the architectures found in the hit films from actual places in Japan. Some of the buildings from the spirit world were based from Edo-Tokyo Open Air Architectural Museum that he often visited. He also got inspiration from a traditional Japanese inn located in Yamagat Prefecture called Notoryayokan. And the famous bathhouse? It was inspired from Dōgo Onsen—a hot spring located in Ehime Prefecture. Even if that’s the case, these photos show undeniable similarity from the film that you MUST add this to your go-to place list! Recall the iconic bathhouse from the film? 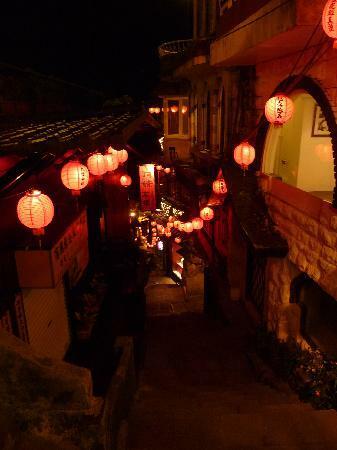 One of the popular places in Jiufen is the A-Mei Tea House which people mistakenly thought inspired Miyazaki. Jiufen is also known for its food hub — where every nook and cranny are filled with street food stalls that will make your mouth water. No wonder Chihiro’s parents couldn’t resist the smell of food in the film. One last semblance of the film and this place is that they both have a railway station! You would definitely mistake this place as Miyazaki’s source of inspiration during his filmmaking. But even if it wasn’t so, we’d like to get ‘spirited away’ into this place — ASAP!